Think about it, your clamp pads work hard all year long carefully moving around boxes and paper rolls without scratching, crushing or dropping them. Their thankless work has more than likely saved you downtime and the need to replace damaged items. When your clamp pads wear out, they need to be replaced. 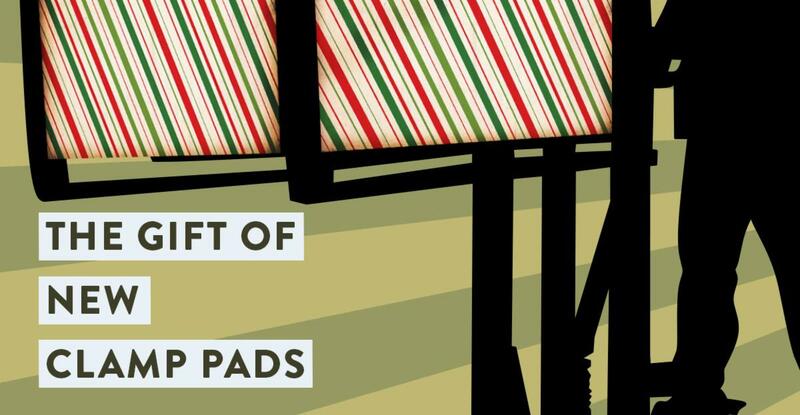 Do you, your forklift and your wallet a favor this holiday season by letting us recover your clamp pads instead of buying a brand-new pair. Starting the gifting process is easy. We’ve got a lot of elves on the job, with years of experience, that can take your existing substrate (which almost never wears out) and recover it with quality Endurawear™ rubber, so it looks and performs like new. You send us the substrate and we’ll recover it and get it back to you before you can say Happy New Year. Re-covered clamp pads are the gift that keeps on giving. Recovered clamp pads will come back from our workshop with the same, if not better, durability as a brand-new pair. We use our proprietary Endurawear™ rubber that is designed to last; we stake our name on it. We’re no Grinch. Recovering a clamp pad is about one-third of the cost compared to replacing the entire pad. Those are savings that can go directly into your Christmas stocking! And since we use your original pads’ mounting holes, there’s no fiddling with getting the clamp pads back on the machine and no sending back because you ordered the wrong size. After-Christmas returns will be a thing of the past! Make it a very Merry Christmas. At Sioux Rubber & Urethane, we’ve been recovering clamp pads for more than 30 years. We know our stuff. You can trust that we’ll have your forklift’s clamp pads recovered and back to work in no time. You won’t waste time waiting for a new pair to be ordered and you won’t be disappointed with the results. Keep your forklift and your bottom line happy, contact our sales staff today to find out more about why recovered clamp pads from Sioux Rubber & Urethane should be on your Christmas list.